28 SEPTEMBER 2018 | NEW YORK – The World Health Organization (WHO) today released SAFER, a new initiative and technical package outlining five high-impact strategies that can help governments reduce the harmful use of alcohol and related health, social and economic consequences. 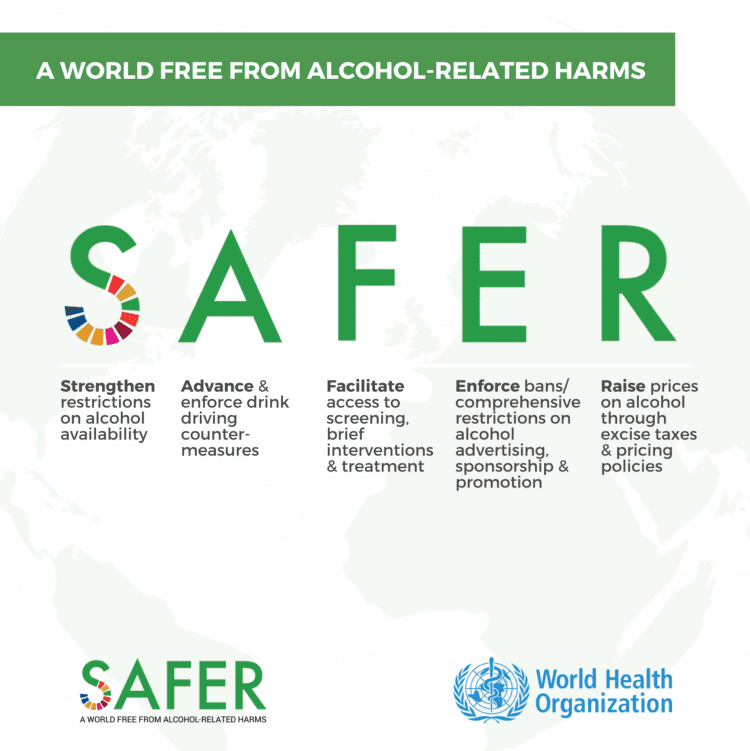 SAFER is the newest WHO-led roadmap to support governments in taking practical steps to accelerate progress on health, beat noncommunicable diseases (NCDs) through addressing the harmful use of alcohol, and achieve development targets. We have seen too little progress since the endorsement of the ‘Global strategy to reduce the harmful use of alcohol’ by the World Health Assembly eight years ago. But SAFER brings new impetus for action,” said WHO Assistant Director-General Dr Svetlana Axelrod. Action is needed to reduce the burden of alcohol-related harm in low-, middle- and high-income countries. According to the GSR, an estimated 2.3 billion people are current alcohol users, but consumption varies across regions. More than a quarter (27%) of all 15 to 19-year-olds are current alcohol users, with rates of current alcohol use highest among this age group in Europe (44%), followed by the Americas and the Western Pacific (both 38%). Alcohol is consumed by more than half of the population in three WHO regions – the Americas, Europe and the Western Pacific. Current trends and projections point to an expected increase in global alcohol per capita consumption in the next 10 years, particularly in the South-East Asia and Western Pacific Regions and the Region of the Americas. Almost all (95%) countries have alcohol excise taxes, but fewer than half use other price strategies such as banning below-cost selling or volume discounts. The majority of countries have some type of restriction on beer advertising, with total bans most common for television and radio but less common for the internet and social media. Some countries have implemented and enforced policies to reduce alcohol use already. In the United States, states that increased the legal alcohol consumption age to 21 saw a 16% median decline in motor vehicle crashes. In Brazil, reducing the opening hours of bars from 24 hours a day to closure at 11 pm was associated with a 44% drop in homicides. Multiple partners, from governments to civil society organizations, have lent their support to the new SAFER initiative. In Sri Lanka, we are showing that alcohol control is a cost-effective and impactful tool to help promote sustainable development, including health for all,” said H.E. President of Sri Lanka, Maithripala Sirisena. With the launch of SAFER, alcohol policy finally emerges from its long hangover. Alcohol policy has not been visible on the public health decision-making table for way too long – SAFER changes that and will draw a line in the sand. As part of the SDGs, the global community has committed to 17 goals with 169 targets. Alcohol is specifically addressed in the SDGs; target 3.5 is “Strengthen the prevention and treatment of substance abuse, including narcotic drug abuse and harmful use of alcohol.” Alcohol significantly impacts several other SDG health goals, including: reducing premature deaths from NCDs by one-third by 2030 (3.4); traffic-related mortality (3.6); and tuberculosis (3.2). Addressing alcohol-related harms would positively benefit other SDG goals, such as reducing violence against women. The WHO Global Monitoring Framework for NCDs includes a target to reduce harmful use of alcohol by at least 10% by 2025. WHO’s five-year strategic plan, the 13th General Programme of Work 2019-2023 (GPW13), notes that action to reduce the harmful use of alcohol is a global priority. WHO directs and coordinates international health within the United Nations system. Working with its 194 Member States, WHO’s mission is to promote health, keep the world safe and serve the vulnerable. For more information about WHO, visit www.who.int. Follow WHO on Twitter and Facebook. The World Health Organization (WHO)-led SAFER is a new initiative and technical package outlining five high-impact strategies that can help governments to reduce the harmful use of alcohol and related health, social and economic consequences.